WASHINGTON -- U.S. builders started more houses and apartments in February and obtained permits for future construction at the fastest pace in 4½ years. The increases point to a housing recovery that is gaining strength. The Commerce Department said Tuesday that builders broke ground on homes last month at a seasonally adjusted annual rate of 917,000. That's up from 910,000 in January. And it's the second-fastest pace since June 2008, behind December's rate of 982,000. Single-family home construction increased to an annual rate of 618,000, the most in 4½ years. Apartment construction also ticked up, to 285,000. The gains are likely to grow even faster in the coming months. Building permits, a sign of future construction, increased 4.6 percent to 946,000. That was also the most since June 2008, just a few months into the Great Recession. And the figures for January and December were also revised higher. Overall housing starts have risen 28 percent higher over the past 12 months. "The road ahead for housing is still, so far, looking promising," Jennifer Lee, an economist at BMO Capital Markets, said in a note to clients. 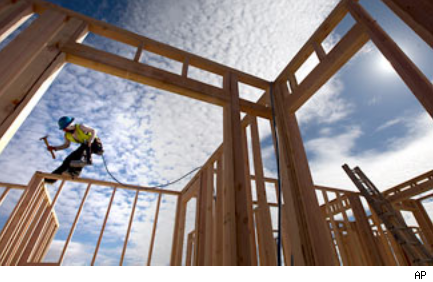 Housing starts jumped in the Northeast and Midwest, while they fell in the South and West. Permits rose in the South, West and Midwest, falling only in the Northeast. The U.S. housing market is recovering after stagnating for roughly five years. Steady job gains and near-record-low mortgage rates have encouraged more people to buy. If there's a place that proves the darkest days of the housing crash are behind us, it would be San Jose. Median single-family home prices there have posted double-digit gains on a year-over-year bases for every month in the last six months, according to the San Jose Mercury News. Home values are also on the rise, and many homeowners are moving from red to green in home equity. More than 56,826 homes went from being underwater to above water in 2012, the Mercury News reported. According to Trulia, the median sales price of San Jose homes was $480,000 from December to February -- a 28% rise from the same period a year earlier. Home sales in Maine have been on a steep incline, with the number of single-family home sales jumping 21 percent in January from a year prior, according to the Portland Press Herald. That could be because the Portland area is enticing people of all ages to move there. Forbes named Portland one of the best cities for young professionals in 2011, citing its reasonable cost of living and low unemployment rate. And the magazine just recently named nearby Bangor one of the best cities to retire in 2013. Find homes for sale in Portland, Maine, or search listings in your area. Surprisingly, Trulia's Price Monitor marked Salt Lake City as one of the nation's most booming housing markets in February. Year-over-year asking prices in the city jumped 17 percent in January, and because job growth is strong, homeowners are less likely to fall into foreclosure and infect the local housing market. Find homes for sale in Salt Lake City, or search listings in your area. The median sales price of homes in Tucson was $149,000 in February, a whopping 19 percent hike from the same period a year earlier, according to the Arizona Daily Star. Another bit of good news is that the city also logged the lowest number of monthly foreclosures than during any month since March 2008. But a word of caution: Cash sales made up 40 percent of transactions in February. That indicates that investors are still driving a large chunk of the home buying action in Tucson, which could undermine its recovery if first-time homebuyers don't jump in the game. Find homes for sale in Tucson, Ariz., or search listings in your area. Homebuyers are clearly flocking to Des Moines. Home sales there spiked 32 percent in January from a year earlier -- making it the best January performance in five years, the Des Moines Register reported. The January median home sales price of $143,000 was a 13 percent hike from the same period in 2012, and pending home sales were up 16 percent. Not a lot of bad news there! Find homes for sale in Des Moines, Iowa, or search listings in your area. Here's the thing about Poughkeepsie: Home prices have remained fairly stagnant for quite some time. But a growing job market could change all that. For now, prices have been at a virtual standstill since 2009 -- but local Realtors say that, at the very least, that means that they're stable, the Poughkeepsie Journal reported. What may help is a rental market so unaffordable that many people could be pushed into buying a home where the monthly mortgage payment is more affordable. According to the Times Union, Poughkeepsie ranks as the 20th least affordable city in the U.S. for renting. Find homes for sale in Poughkeepsie, N.Y., or search listings in your area. Richmond's housing market is on a slow and steady track of improvement. Home sales have taken a recent dramatic upturn, and home values have begun to appreciate for the first time in five years, local Realtors told Richmond Magazine. But new construction is down, and housing supply may be too small. Still, an increase in job growth and population is bound to spur new developments and a rush for new homes. Find homes for sale in Richmond, Va., or search listings in your area. Minnesota's housing market in general is doing gangbusters, with home prices at their highest level since 2008 and for-sale inventory at its lowest in a decade, according to KTSP-TV in Minneapolis. Local Realtors say the time it takes for homes to sell is growing short and shorter, and sellers are nabbing offers that are coming closer to list prices. According to Virtual-Strategy magazine, homebuyer activity in Minneapolis was up 40 percent in January from a year prior. Find homes for sale in Minneapolis, or search listings in your area. Bakersfield ranks among the top 10 cities that saw the biggest rise in home prices in 2012, recording a 6.1 percent rise over the course of the year. The local market has heated up so much that experts have questioned whether Bakerisfield is in another bona fide housing bubble. That's not a good thing: The bubble is being driven by investors buying foreclosed homes to fix up and rent out, according to The Bakersfield Californian. That indicates that homes aren't becoming any more attainable for everyday hoembuyers. Find homes for sale in Bakersfield, Calif., or search listings in your area. Houston doesn't have any problem getting people to move there. Forbes ranked it the coolest city to live in and the No. 2 fastest-growing city in America. With so many new residents moving to the city, home sales jumped 16 percent over the course of 2012, and based on recent home buying activity, it would only take 3.7 months to sell everything on the market, according to the Houston Chronicle. Find homes for sale in Houston, or search listings in your area. In addition, more people are seeking their own homes after doubling up with friends and relatives in the recession. That's leading to greater demand for apartments and single-family homes to rent. Still, the supply of available homes for sale remains low. That has helped push up home prices. They rose nearly 10 percent in January compared with 12 months earlier, according to CoreLogic, the biggest increase in nearly seven years. The number of previously occupied homes for sale has fallen to its lowest level in 13 years. And the pace of foreclosures, while still rising in some states, has slowed sharply on a national basis. That means fewer low-priced foreclosed homes are being dumped on the market. Those trends, and the likelihood of further price gains, have led builders to step up construction. Last year, builders broke ground on the most homes in four years. Homebuilders have become much more confident over the past year. But in March, a measure of homebuilder confidence fell for the second straight month over concerns that demand for new homes is exceeding supplies of land, building materials and workers. In the short term, that could slow sales. Still, the survey noted that the outlook for sales over the next six months rose to its highest level in more than six years.